Since Ann is a quilter as well as a glass artist, the quilting designs often migrate into the glasswork. This pattern is known as ” Box in a Box. Five individual pieces of coloured glass are cut then placed on a piece of clear glass. The pieces are fused in the kiln.The finished pendant is about 4 cm square. 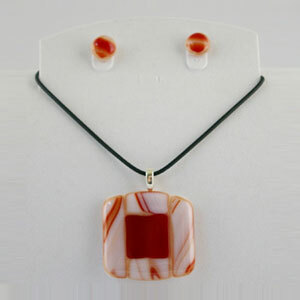 The earrings are made of a small square placed diagonally on another square. Pendant sets can be made in many quilt block designs in a variety of colours.